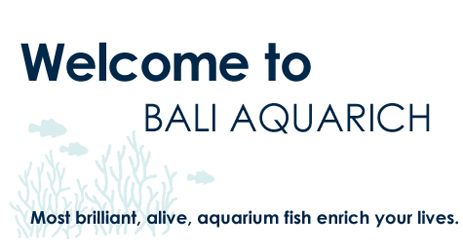 BALI AQUARICH is located at Bali, Indonesia, which is eight degrees south latitude. The climate is warm all year round. The sea area,without winter and industrial pollution, can steadily provide plentyof high quality fish fry throughout the year. We have bred groupers (Epinephelus) for more than 20 years, and reproduced marine fish fry with more than 30 species. In 2004, we began the breeding of clown fish (Amphiprioninae). In 2006, we renovated the whole facilities in consideration of efficiency, disease prevention, and the variety of fish species. Bali Aquarich’s active area is more than 40,000 meter square. The fish-breeding facilities include indoor, outdoor, and closed system.Currently we produce healthy aquarium fish with colors as brilliant as wild fish, and various grouper fry. We are also developing other fish fry. In the future, we will continue striving to reach the goal of producing many kinds of the healthiest and most fascinating aquarium fish, as well as fast-growing, disease-free, and undeformed fish fry. 版權所有 © 2009 Bali Aquarich. All Rights Reserved.